moment to soak up the contemporary décor, featuring tile ‘mood-boards’ and back-lit graphics as your eye is drawn through to the rear display area. imagine them in kitchens, bathrooms and living spaces. 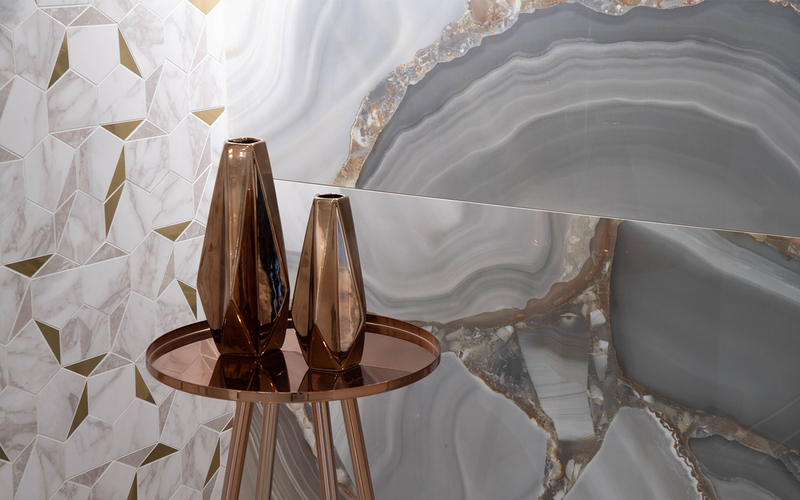 Between each are concealed sliding, large-scale panels featuring more from our carefully compiled collections. A slightly more formal space, we can imagine design teams gathered around the boardroom table, mulling over choices and picking out selections for forthcoming projects. The room’s fully equipped with the latest audio-visual equipment, WiFi and clever wall-mounted rails on which to stand mood-boards, site plans and (of course) tiles. There’s also a refreshments area and break out space with comfortable chairs for a moment of reflection. 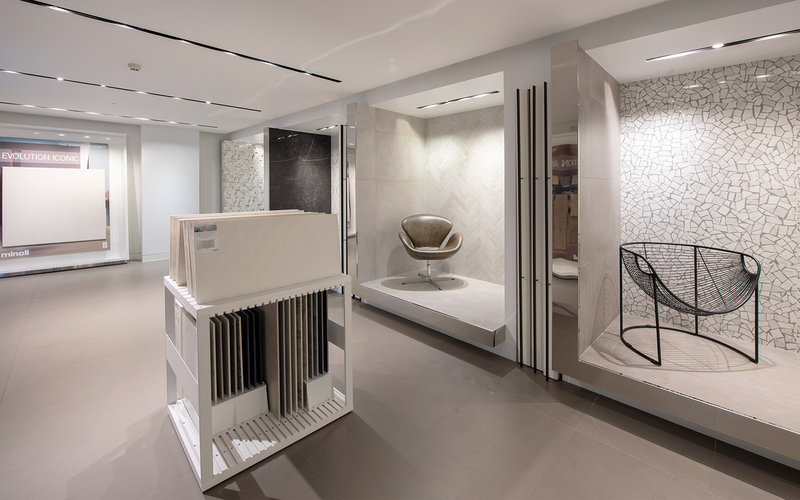 Remember, this is ‘your London home for Minoli’ so we’d encourage you to use our facilities by appointment to meet with, and present our products, to your own clients and colleagues. 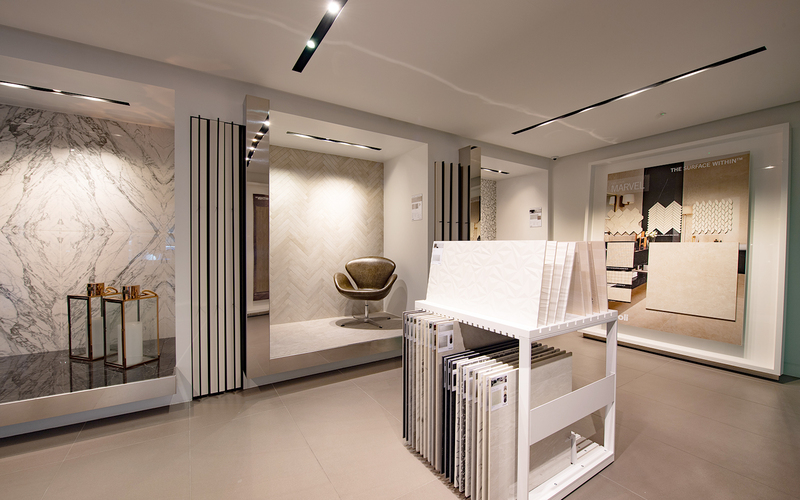 This is the creative space, situated on the lower-ground floor with a purpose-built work-bench, on which to compare and contrast tiles from the samples library, and further room settings and display units. It’s also adjacent to our hospitality space, refreshments bar and galley where you’ll find freshly made coffee, a selection of soft drinks, and even the occasional glass of vino to help fuel the creativity! In short, the Studio is the ideal place to roll up your sleeves and enjoy choosing from our Core and Contemporary Collections. Last, but not least, The Retreat is a secluded haven from the hustle and bustle of the streets above. Of course beautiful ceramic and porcelain samples adorn the walls, but this is first and foremost a space for relaxation! With low-level lighting and seating, sumptuous sofas and a wall mounted flat-screen TV, we’d welcome you to come and take the weight off after a busy day in the West End – whether on business or visiting for pleasure. There’s also desk-space and WiFi in case you need to get online or catch up on e-mails, in privacy but amongst friends. Minoli have always had strong links with London through the company’s heritage and our relationships with clients and distribution partners based in and around the capital. The company was in fact founded in London by Luigi Minoli in the 1940s, initially producing and installing Terrazzo from premises in Islington and, though later relocating to Oxford, we’ve always recognised the importance of servicing the vibrant and expanding market that the capital provides. Now, some 55 years hence, we’ve returned to our roots and opened a brand new London showroom, called The Surface Within, at 71-73 George Street W1. George Street runs north of and parallel to Oxford Street. Ideally located for ease of access from Mayfair, Marylebone and Marble Arch, we hope our clients will be drawn to visit us, as well as making the most of the fabulous amenities that our surrounding neighbourhood has to offer. The row of terraced shops and housing, in which our new showroom resides, was built around 1800 and is associated with the Portman Estate, Gloucester Place development. Grade 2 listed and with English Heritage certification, having only been cosmetically refurbished since construction, the façade of No 71 still retains ornamental stone carvings depicting four lions along the frontage, perhaps the mark of the builder or owner of the development at the time. Despite the historical references, the concept of The Surface Within is that of a state-of-the-art ‘resource centre’ for all our clients and distribution partners. This stunning new venue offers a comprehensive showcase of all our latest products and convenient access to the Minoli team for advice and information about the right surface solution for you. 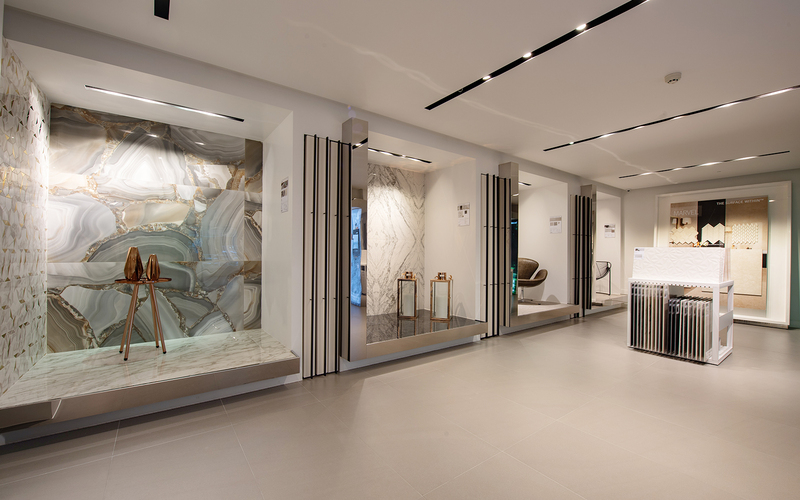 In designing the space, we’ve thought carefully about our clients’ needs and created four main areas, each with a specific focus on providing an excellent Minoli customer experience, whatever your reason for visiting. Nestled between Baker Street and Gloucester Place, just above Portman Square and Oxford Street. The closest tube station is Marble Arch, but you can easily stroll from Bond or Baker Street stations as well. If you’re coming by car, there’s generous on street parking on George Street and neighbouring roads, plus several signposted car parks nearby.